Artist Statement: Bletchley Park remains a building of immense historical note. Housing the secretive machinery deployed in the infamous code-breaking technique of the Second World War, it has long held fascination for historians and artists alike. Secrecy demanded the destruction of almost all of their records at the end of the war and the site is now a museum that relies on voluntarily gathered information on the individuals who worked inside these enigmatic walls. A house clearing took place in 2015 unearthing of thousands of photographic slides. 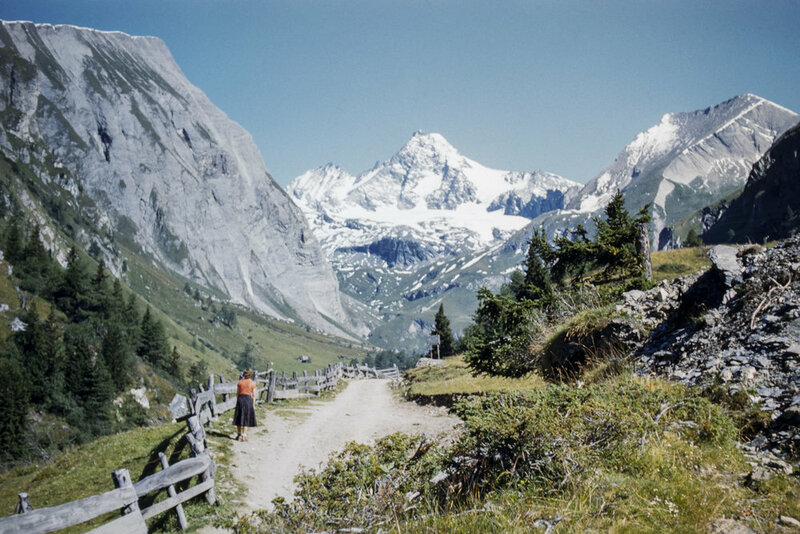 These slides documented trips taken around Europe between the 1950s and the 1980s by two individuals. As well as this discovery were a host of artefacts, including letters written during the 1940s and 1950s that unlocked an intimate photographic narrative. My Dearest Beatrice examines a tale of deep love and devotion of two people who met at the height of the war. 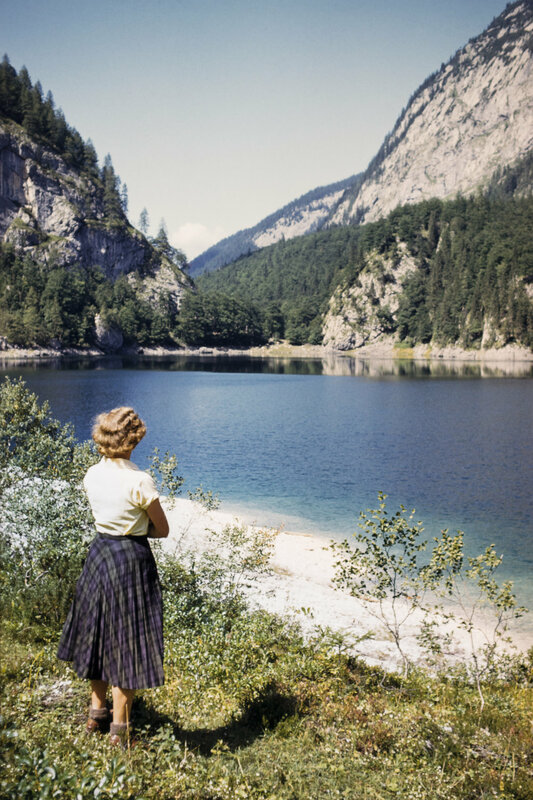 The process unearthed over 300 of the 4,000 enigmatic slides documenting the artist’s Great Aunt and wife of the original photographer gazing into distant landscapes. Alongside intimate letters detailing the couple’s time at Bletchley Park, the work seeks both to reveal and maintain confidences, honouring and preserving a delicate love story. They had secrets to keep for years; those secrets remain. Where did you attend university and what year did you graduate? I applied to Plymouth College of Art to study photography in 2013. Starting on a foundation year before the three year degree programme, I have just completed four years at the college, graduating in June of 2017 with a First in BA (Hons) Photography. What are some standout moments from your time at university? LensCulture host international awards throughout the year. I entered the Emerging Talent 2016 awards and was delighted when I was chosen as one of fifty winners worldwide with the first incarnation of My Dearest Beatrice. I’ve always been overly critical of myself and my work so to have it recognised by an international jury really helped with my confidence and motivation to produce work. Which photographic genre do you consider your work to fall into? It’s difficult to find one genre to place my current work. Visually, I consider it as landscape, portraiture and still life. The project as a whole is documentary, retelling a historical tale through found photography and artefacts, photographed to present them as an archive. What themes do you find yourself exploring? Photography I see as just one medium to express my thoughts, feelings and interests. Art as a therapy has been that one steady rock that has helped me cope with recent issues I had experienced. In the projects I created in response to the assignments on my degree programme, I found myself addressing personal issues such as mental health and my own family history and experiences. These projects, along with a couple more currently in development, address memory and sentiment. How did this series arise for you? Where did your interests come from? This particular series came about very rapidly. A few of my projects immediately before My Dearest Beatrice were centred on personal experiences with mental illness, particularly anxiety, followed by a project documenting family heirlooms. The focus has always been around personal history, family history and local history. I grew up with an interest in the local history of Cornwall, full of myths and legends that I found fascinating. Losing close family members at a young age made me obsessed with sentimentality, memory and subjects around death. I am now obsessed with documenting and archiving. How did you make these images? These images for My Dearest Beatrice are family pictures from relatives I had hardly met. My Great Aunt died in 2014 after my Great Uncle in 1998. I discovered the photo slides taking up a whole wardrobe. It was like finding treasure. The journey up to Sheffield from Cornwall meant there was limited space in the car so I only came home with one box of slides, Venice 1957. Upon viewing them, I knew they were too important to leave behind so I drove back to Sheffield a few weeks later to pick up the rest of the slides. The process of photographing the slides individually was a personal choice. I feel closer to the people and places depicted in the photographs. I purchased an attachment for my 40mm lens and aimed at a good light source, was perfectly useful to digitise the slides. What have you learnt whilst making this series? On top of the valuable technical skills such as shooting and lighting techniques, retouching and presentation, the contextual history has been a welcome addition to my knowledge base. I’ve learnt about Bletchley Park and with the personal connection, have had the drive and energy to find out more, leading to a visit during the research period. Also, the locations depicted in the slides have led me to consider further project ideas and the desire to travel to these places. Did any photographers influence you during the creation of My Dearest Beatrice? John Hinde’s work was suggested to me during my research time for this project. The picture postcards and the beautiful colours of his photographs were a huge inspiration for me and a reference point to keep my slides looking as close as I can to the look of the time. Another influence for my photographs was Mike Perry’s work Môr Plastig which was exhibited at the gallery where I work in Plymouth. Perry beautifully presented photographs of man-made litter washed up on beaches, taken out of their context and photographed raised on a plain white background. This presented the objects in their own space, without external influences and made it look like the objects were actually present, not photographs. This technique proved successful for the maps and letters I had to photograph. How did you present My Dearest Beatrice when complete? The process of choosing which photographic slides to use as final images was difficult with over 4,000 to choose from. The 300 or so of Beatrice gazing into the landscape narrowed it down somewhat, but in the end, it’s what looked best together and with the letters and maps. The exhibition at the Truman Brewery in London was a tough space to work with. I had thought about the idea of projecting the images to bring out the fact that the images started as slides. For the final show, I opted for traditional prints. Where do you hope for your work to take you in the future? My Dearest Beatrice is still on-going and ever changing. The slides are such a rich and valuable resource that one project doesn’t seem enough. 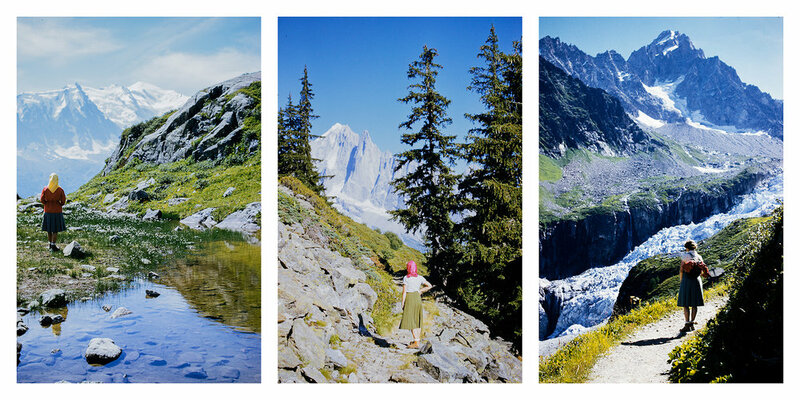 Travelling to the places captured on the slides and comparing them to today would be an intriguing next project. A big fan of photo books, I am hoping to put together a book containing most or all of my final images from different incarnations of My Dearest Beatrice.